1 Who is Sofia Carson? Sofia Daccarett Char was born on 10 April 1993, in Fort Lauderdale, Florida USA, under the zodiac sign of Aries, and known as Sofia Carson – having taken her mother’s last name – is an actress who appeared in Disney Channel’s comedy television show “Austin & Ally” and starred as Evie, one of the main characters of the movie “Descendants”. Additionally, she is a singer, and in that field has released “Rather Be with You” and “Ins and Outs”. to each and every single 10 Million of you. I love you forever. from the bottom of my heart, thank you for being on this ride with me. here's to more moments like this. So just how rich is Sofia Carson as of early 2018? According to authoritative sources, this actress and singer has a net worth of $6 million, with her wealth being accumulated from her over six years long career in the previously mentioned fields. Sofia is 1.63 meters tall, has hazel eyes and black hair. Carson was born to Laura Char Carson and José F. Daccarett, who moved to the US from Colombia. Her mother’s side of the family is related to the Char family, noted politicians in Columbia; she has one younger sister, named Paulina. Sophia was a student of St. Hugh School, but matriculated from Carrollton School of the Sacred Heart, located in Miami. Besides that, she attended In Motion Dance Studio, being a part of their IMPAC Youth Ensemble program. Subsequently, Sophia was a student of the University of California, Los Angeles and majored in communications, with a minor in French. In 2012, Sofia signed a deal with BMI, serving as a singer-songwriter. She made her acting debut in 2014, being cast to play Chelsea as a guest star in “Austin & Ally”, a Disney Channel comedy series, which follows the story of a group of friends and their rise to stardom. 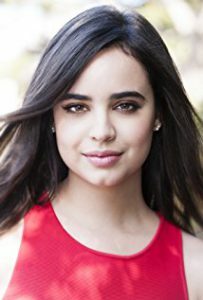 Several months later she joined the cast of “Faking It”, broadcast on MTV, and in the same year landed the role of Evie, one of the main characters of ‘’Descendants’’. Working on that project, Carson made her breakthrough, as the movie was fairly popular with the younger audience. In 2016, she made an appearance in “Soy Luna”, an acclaimed Argentine series, in which she worked alongside actors such as Karol Sevillas, Ruggero Pasquarelli and Valentina Zenere. During the same year, Sofia joined the cast of “Adventures in Babysitting”, starring opposite Sabrina Carpenter. In 2017, Sofia reprised the role of Evie in the sequel of “Descendants”, entitled “Descendants 2”, working with Dove Cameron and Cameron Boyce; the movie was watched by an audience totaling almost nine million people on its premiere night alone, and was additionally nominated for a Saturn Award in the category of Best Television Presentation. In that year, Sofia also provided voice recordings for the role of Keemia Marko/ Sandgirl in an episode of “Spider-Man” entitled “Sandman”. When it comes to her latest projects, she played Sloane in an episode of “Famous in Love”, a television series based on the book of the same title written by Rebecca Serle, and which gave Sophia a chance to work with Charlie Depew, Bella Thorne and Carter Jenkins. Speaking about her future projects, Sofia will portray the main character, Ava in “Pretty Little Liars: The Perfectionists”, based on the novel by Sara Shepard entitled “The Perfectionists”. The series will follow the story Beacon Heights, a town which seems perfect on the outside, but holds many dark secrets. Unfortunately, we have no information regarding Sophia’s dating history, and as of today, she is reportedly single. Sofia is a close friend of Dove Cameron, with whom she also worked on “Descendants”, and with whom she sang “Space Between”, which was featured on the soundtrack of “Descendants 2”. However, some people believed that Sofia dated her “Descendants” co-star, Cameron Boyce, which was never confirmed by either one of them, and it seems as if they’re just good friends. Being active in the entertainment field naturally means that Sofia shares a fair amount of information with her fans through social media. She is active on Twitter and Instagram, and is followed by 600,000 people on the former and almost 10 million on the latter. Additionally, she shares photos of herself and her friends on both accounts. In one of her most recent interviews, Sofia revealed that her favorite song that she has made so far is “Back to Beautiful”, adding that the song was written for her by Julia Michaels and that, even though it is hard to sing songs that other people have written, she was lucky enough to connect with Julia. The song was described by Sofia herself as an “anthem about how beauty isn’t skin deep”. Additionally, she has begun working on new music, which she announced through a photo of a studio microphone and the caption: “Hello”, and was vocal about the fact that she wants to make more music, which excited her fans all over the world. In late March, she posted a photo of the cast of “Pretty Little Liars: The Perfectionists” with the following caption “To our @PLL #ThePerfectionists family, THANK YOU, with every piece of my heart. I am honored to be a part of this journey, I am honored to be your Ava. Until next time, sending you all my love and immense gratitude… Your Sofia”, indicating that the filming of the pilot episode in Portland had ended. As of today, Sofia resides in Los Angeles, California.